When the United States was hit with a recession nearly a decade ago, Wisconsin was not spared from widespread economic downturn and unemployment. But in the years following the Great Recession, Wisconsin’s unemployment rates have been looking up. The Wisconsin Department of Workforce Development released a report from the U.S. Bureau of Labor Statistics June 22 outlining the state’s unemployment statistics. Four months later, now-Sen. Tom Tiffany, R-Hazelhurst, penned a column published in the Green Bay Press-Gazette boasting Wisconsin’s low unemployment rate statistics. “Wisconsin’s unemployment rate is at 4.2 percent and our state now has a record number of people working. Workers who want full-time employment are now having an easier time finding it,” Tiffany wrote. The DWD report found that as of May 2016, unemployment rates dropped or remained the same in all of Wisconsin’s 72 counties compared to April 2016 rates. It also found that the state’s unemployment rate to be 4.2 percent, the lowest it’s been since 2001. Nationally, the DWD reported the unemployment rate to be 4.7 percent, placing Wisconsin about half a percentage point lower. Click the map to see the name of a county and its unemployment rates from April and May of 2016 and May 2015. The darker the county, the higher the unemployment rate. These colors are based off of data from May 2016. Tiffany represents the state’s 12th Senate District, located in the north-eastern part of Wisconsin. This includes parts of Florence, Forest, Langlade, Lincoln, Marinette, Menominee, Oconto, Oneida Shawano and Vilas counties. While Tiffany’s statements about the state’s unemployment rate ring true, the rates within the counties he represents tell a different story. 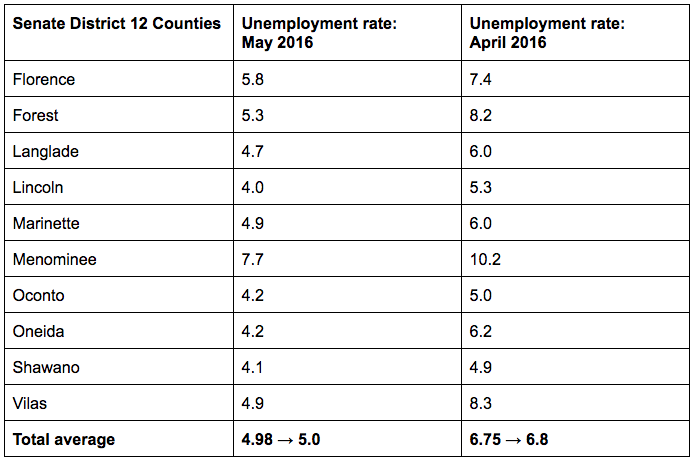 The average unemployment rate in the counties that represent District 12 reached 5.0 percent in May 2016. This is not only higher than the state average, but the national average as well. The county with the lowest rate in District 12 was Lincoln, with a rate of 4.0 percent, and the county with the highest rate was Menominee, at 7.7 percent. Menominee’s rate is the highest in the state of Wisconsin. On his campaign website, Tiffany wrote, “Getting the residents of northern Wisconsin back to work has been one of my top legislative priorities since coming to the Legislature.” Tiffany took office in 2013. In that year, Menominee was also the county with the highest unemployment rate in the state at 13.8 percent. Tiffany acknowledged that the unemployment rate in his district was higher than the rest of the state but also told The Observatory that he has fought to bring employment opportunities to northern Wisconsin. He noted specifically the controversial iron ore mining bill he authored. Though this bill passed in 2013, the project was eventually halted. 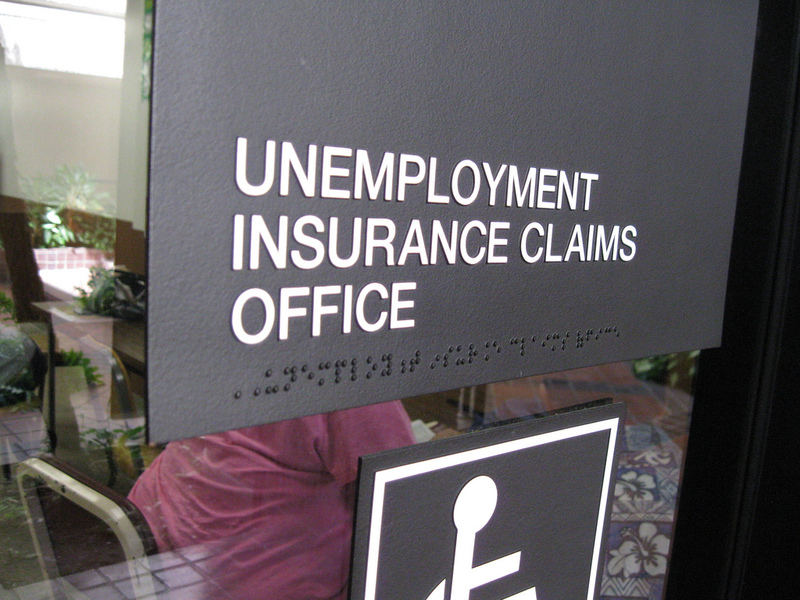 The senator also noted that unemployment rates in Wisconsin have decreased over the years. But when addressing the claim at hand, Tiffany was correct to say Wisconsin is at a 4.2 percent unemployment rate. 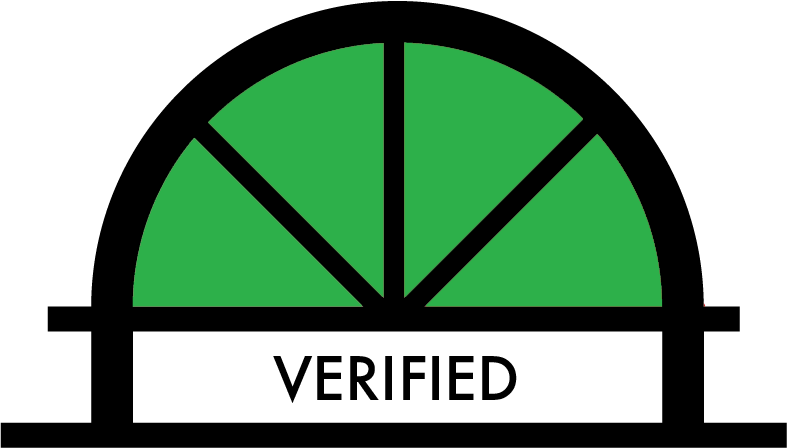 The Observatory finds this claim to be verified, even though it is not representative of the district the Senator represents.